Tarleton State University’s second Texan Debate came to an end on Thursday evening after the fourth and final debate at 7 p.m. in the Fine Arts building. This year’s controversial debate topic was about building a wall on the United States’ southern border. The all-day event opened with a Civic Expo that took place from 11 a.m. to 1 p.m. by the Dining Hall patio. There were campus organizations with tables set up, including Gamma Theta Epsilon – a geographic honor society, the LGBTQ Alliance, Tarleton’s Social Workers Alliance and many more. Regarding the wall between Mexico and the United States, Lemmons said, “I am against a complete and absolute wall because yes, there will be security, but there will also be exclusivity,” he said. “Often time, we keep the people in we do like and we keep the people out we don’t like. defining who we like and who we don’t like? A lot of it right now is based on socio-economic status. We’re trying to keep poor minority people out, which isn’t the greatest classification on who we let in,” Lemmons explained. 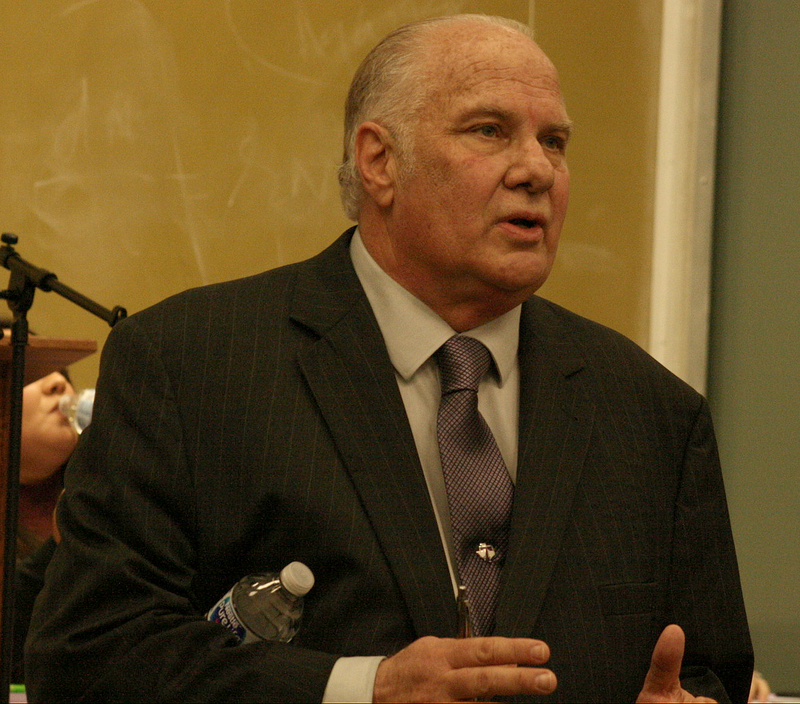 Dr. Del RIchey moderated last semester’s Texan Debate as well. Photo by Lorynne Benavides. The Texan Debate continued with three rounds of debates at 1, 2 and 3 p.m. in the O. A. Grant Auditoriums. Each debate, including the fourth and final one, was moderated by Dr. Del Richey. The final debate was held at one of the theatres in the Fine Arts building. Leader of Opposition, history professor Dr. Jensen Branscombe and Chelsea Mowles – a freshman nursing major, won the audience over with an overwhelming audience vote of 72 percent while the Prime Minister side with Chris Smith and Stephen Eldridge, an Erath County Precinct Chair, received a vote of 28 percent. Smith began his argument by explaining that the wall would help create jobs such as construction and border patrol, help lower unemployment rate, and that the drugs being smuggled into the country are creating a bigger threat. He also mentioned that 65 other countries have already begun building a wall for their countries to enforce their immigration policy. “If other countries can build their own walls to enforce illegal immigration, then the United States has the right to do the same,” he said. The next person to speak at the podium for the Prime Minister side was Eldridge. Eldridge began to speak on problems he believes we have north of the border in surrounding areas. For the side of Opposition, Branscombe disputed Smith and Eldridge’s arguments. She emphasized to the audience that majority of undocumented immigrants are everyday people and not dangerous. “Ultimately, what it boils down to is humanity,” said Branscombe. Branscombe said that drug abuse will not decrease with the building of the wall because drug cartels and sellers are creative. “Physical barriers cannot stop an idea,” she said. “We are not talking about border security, we are talking about the wall,” said Branscombe. She added that problems such as diseases, as mentioned by the Prime Minister side, cannot be prevented by a wall. Branscombe argued that not only does the wall fail to solve any problems, but that it actually creates new ones, noting that it would strain trade with Mexico and our overall relationship with the country in general. She also argued that a weaker U.S. economy is the reason for the decline in immigration, not stronger border patrol or immigration policy because people come for better opportunities and to escape harsh conditions in their country. Smith responded by saying that when immigrants enter the U.S illegally, they don’t have rights within the country, and that illegal immigrant crossings are hurting our national security. In response to the Opposition stating that only a small percent of illegal immigrants has committed crimes and felonies, Smith said, “you can still be committing crimes and not getting caught.” He also reiterated the fact that being in the United States illegally is a crime. In a quick question and answer session with the audience after the final debate, Eldridge said that if the United States was able to keep undocumented Mexican migrants on the Mexican side of the border, then Mexicans might actually have to face their problems and fix their government. One member of audience called out Eldridge for his words. 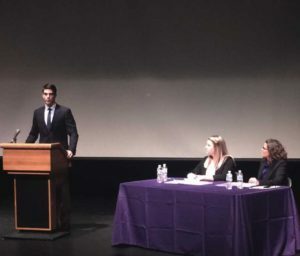 Smith opened the final debate of the evening by giving his arguments on why the United States should build the wall on the southern border. Photo by Latricia Powell, Texan News. Much of the audience broke out into cheer and tension rose a little more between Eldridge and the audience member. After another audience member spoke out as well, Richey ended the Q&A session. After the debate was over, Texan News spoke with Smith and Mowles. Smith says he felt it was harder to prepare for the Prime Minister side than it was to prepare for the Opposition side because there are more statistics to build an argument for the Opposition side than there are for the Prime Minister side. Smith believes he will participate in next year’s debate, but is curious to hear what the topic is before he makes any final decision. “This was a whole lot of work, as well. So, it really just depends on my schedule, as well, but this is something I am definitely considering,” he continued. As for the audience questions, he felt that they were “really good,” Smith said. “I certainly felt targeted by some of the audience members and I wish we would have told everyone that we were assigned which side we were on because at one point I kind of felt a little attacked, but other than that, I liked the questions from the audience a lot,” he added. Mowles says she is “thinking about” joining the conversation on the debate team next semester. Another Texan Debate will take place in the 2018 spring semester with a different controversial topic.